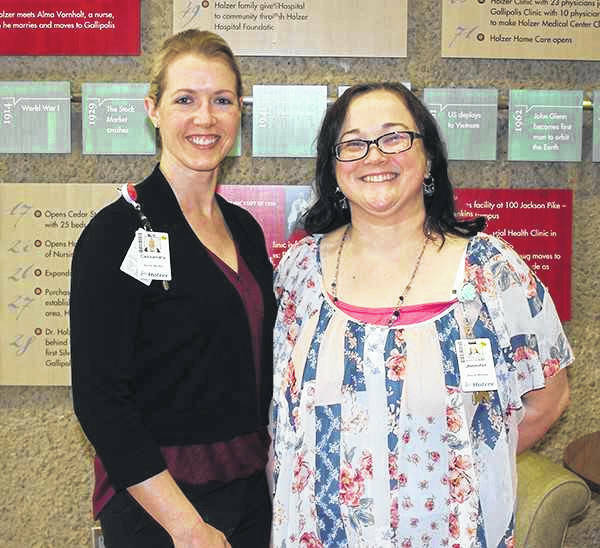 Pictured are Cassandra Hager, MSW, Care Management, left and Jennifer McKenzie, MSW, Care Management. 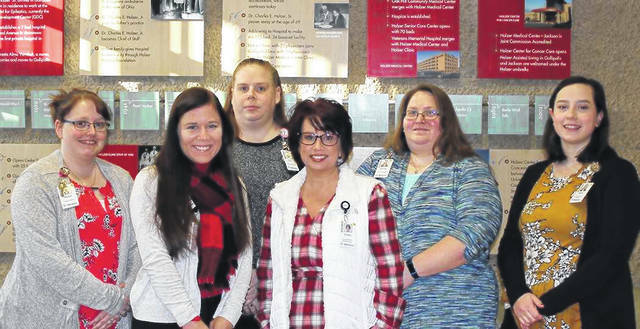 Shown are the Holzer Health System Social Work staff, from left, Emily Ash, MSW, Hospice, Shelly Renagar, LSW, Hospice, Megan Ihle, LSW, Inpatient Rehabilitation, Erin Polcyn, LSW, Psychiatric Unit, Ashley Fitch, LSW, Care Management, and Kayla Mollohan, LSW, Psychiatric Unit. The campaign will inform the public and legislators about the crucial role social workers for more than century have played in improving our society and empowering others. For example, Social Worker of the Year Kimber Nicoletti-Martinez founded an organization to mobilize farm workers in Indiana, California, Pennsylvania and Arizona to prevent child abuse; while social reformer Jane Addams, former Labor Secretary Frances Perkins, and civil rights leaders Dorothy Height and Whitney Young helped Americans secure voting rights, Social Security, unemployment insurance, and other programs. According to the Bureau of Labor Statistics social work continues to be one of the fastest growing careers in the nation, with more than 100,000 people expected to enter the field in just seven years. You can find social workers everywhere in our society. These professionals are in schools helping students overcome life challenges to achieve the best possible education. They are in clinics, hospitals and mental health centers assisting in healthcare delivery; and in federal, state and local government pushing for legislation and regulations to improve quality of life. According to a press release from Holzer Health System, “In the healthcare setting, illnesses can bring many problems. Often, individuals need community resources, but may not know where to turn. Holzer Social Services is skilled in working through these types of situations and helping patients when they need it most. Common patient needs include: patient discharge planning, home health and/or hospice arrangements, placement in a nursing facility (for short-term or extended stays), and home medical equipment needs. In addition, Holzer Social Workers are able to assist with Advance Directives, Living Wills, Healthcare Power of Attorney, and similar paperwork. For any questions or more information, call 1-855-4-HOLZER and ask for the Social Services Department.